Who says brides are the only ones who struggle with a wedding outfit? 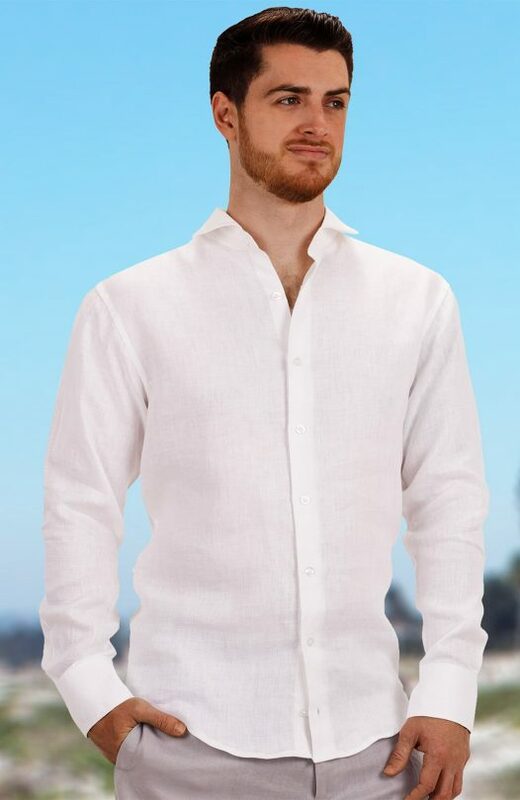 When you’re tying the knot at the beach, picking the perfect threads can be just as big a challenge for the groom! The thought of getting married in the heart of nature may be exceedingly romantic—saying “I do” a gorgeous altar, overlooking a pristine blue ocean. Beautiful as it sounds, however, it can be an uncomfortable experience if you’re dressed for the occasion, but not the venue! 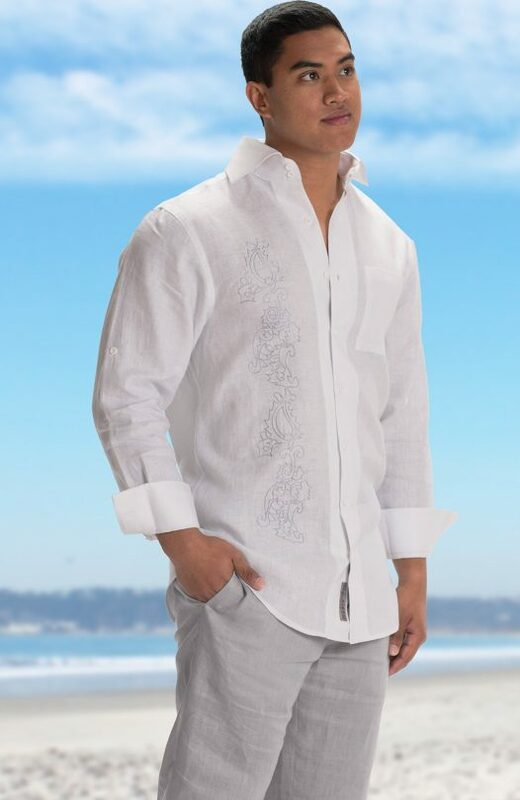 Wedding Tropics brings you an exquisite line of beach-themed wedding attire for grooms. Tropical weddings are inherently unique and playful. Stay true to the spirit of fun and choose a suit that’s casual, authentic and chic! 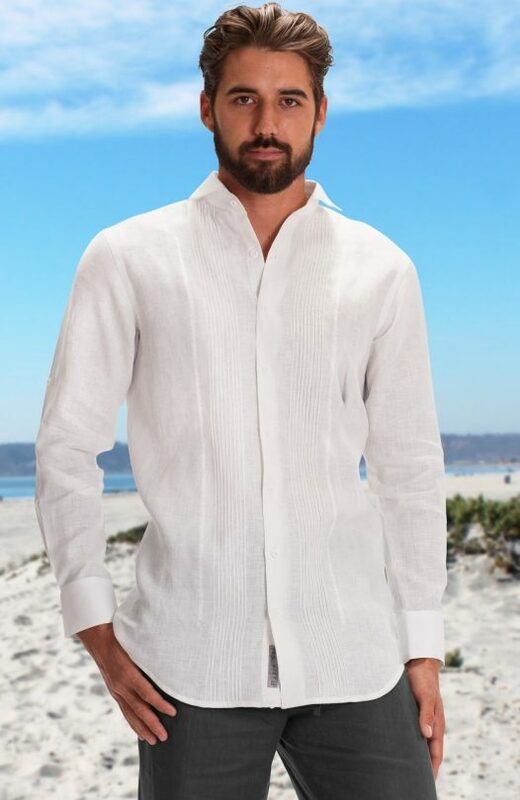 Our sleek and cool Bradford in White or Bone color featuring a relaxed fit with square hem or fitted cut with rounded hem, a standard cut-away collar, and long sleeve. The Bradford is made of a soft high quality 100% linen, perfect for formal or casual wear. The Colima features a beautifully scalloped embroidery design which is divided by a small row of pintucks. Features a “relaxed” fit with detailed side buttons and straight bottom hem. Choose from short or long sleeve, and bone or ivory. The Balos is adorned with a modernized tribal design and elegant matching embroidered design on the inside cuff. Choose 2 different fabric colors, white and bone with matching embroidery. 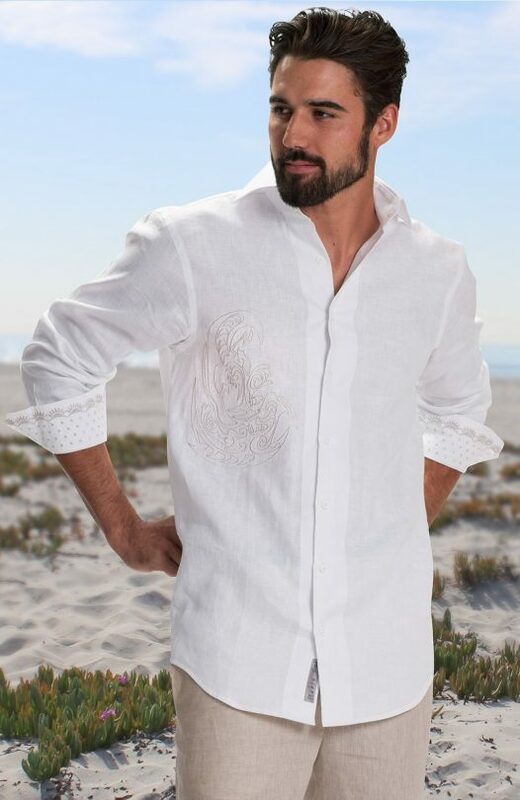 NOTE: The image shows the shirt in white with natural embroidery, which we do not stock. To order this color combination, please proceed to the design it option. Hover over thumbnail pictures to note product color options. Select the “Design It” button for our made to our order option. It includes more sizes up to 5XL, additional color, fit, style, and personalization options, as well as an option to tailor the fit. Whether it’s your wedding or other special occasions, nothing is classier than this gorgeous vest. Sophistication and style is the name of the game, and you can’t spell it without Monaco.